If you are still keeping up with that New Year diet then this salad is ideal. Inspired by Middle Eastern cuisine where beans, yoghurt and mint are widely used. To make this dish more substantial, you could serve it on a bed of rice, couscous or bulghur wheat. For convenience use canned chickpeas. they are cheap and save time. Heat 2tbs of the olive oil in a frying pan. Add the mushrooms, season with salt and cook until softened. Reduce the heat, then add the garlic, chilli and chickpeas. Fry for 2 minutes, then add the cumin and half the lemon juice. Cook until the juices in the pan evaporate and then set aside. Put the yoghurt in a bowl, then add the chopped mint and the rest of the lemon juice and oil. Add salt and pepper and mix until blended. 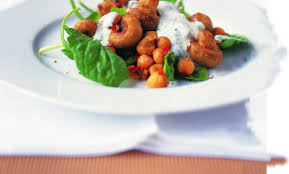 Divide the spinach between four plates or put on a serving platter, add the chickpeas and mushroom mixture, then pour the yoghurt dressing over the top.